Search Online & Earn Points for Gift Cards, Cash & More! Home » Search Online & Earn Points for Gift Cards, Cash & More! 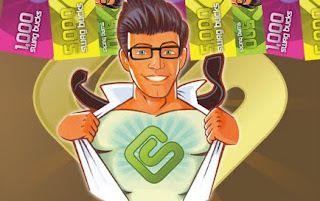 Swagbucks is one of the easiest ways I have found to make a few extra bucks!! And I am all about saving every penny I can and earning money online! Basically you earn “swagbucks” or points for searching online! That’s it- it’s really simple! A digital dollar! You can also earn their swagbucks points by shopping online. It’s just like google- when you want to browse online you use their toolbar and they will randomly award you swagbucks just for searching. Once you get 450 swagbucks you can cash out for a $5 Amazon gift card! They have a lot of prizes like Target gift cards, Paypal cash, airlines points, and all sorts of things!! Check out Swagbucks for a jump start on free gift cards!! Over the past 2 years that I have used Swagbucks I have been able to buy many Christmas presents by using Amazon gift cards from my Swagbucks as well as buying iTunes gift cards every year for my nephew. It sure makes a difference to save that extra money during the holidays, although you can cash your points out at any time of the year! We just use ours for Christmas gifts! My friend over at Penniless Teacher just told me that she used her Amazon gift cards from Swagbucks to pay ONLY $50 for the refurbished Kindle Fire today that is on sale for $139!!! Awesome deal Penny!